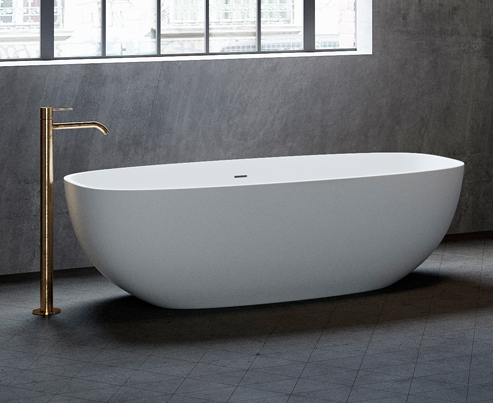 VALLONE combines excellent design with high end material. In regard to our individual product form and the soft surface, we developed VELVET STONE, an exclusive mineral cast, highly solid and sturdy as well as flexible for ideal fabrication. Learn more about VELVET STONE by VALLONE. „Like a warming stone“ – VELVET STONE™ is the perfect material for heat insulation. The soft and warm surface is something you will never want to miss again. The casting technique enables fine lines combined with enormous stability in our products. 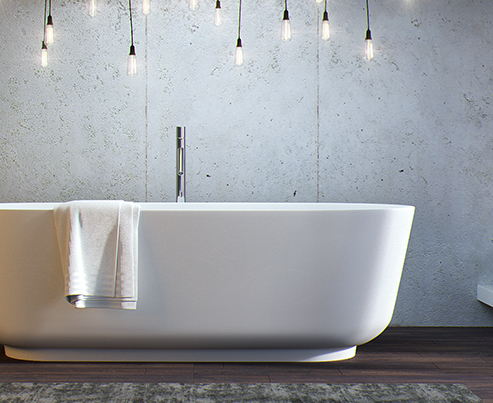 The luminous white surface will lend a particular charm to your bathroom space. In adding premium resins, our material develops an extremely resistant structure. Our products therefor gain excellent sturdiness and stability. VELVET STONE™ is perfect for fitting tapware individually to your taste. Drilling for taps can be easily done and enables flexible fittings. The standard model of our designs comes with a matt finish. A glossy surface can be added without additional cost. 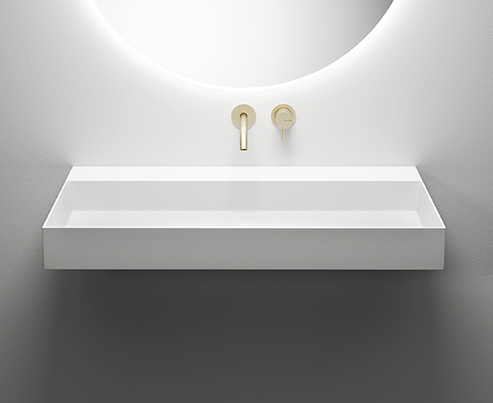 The natural white of our VALLONE® products is the standard characteristic of our designs. Individual colors are available on special request. We offer a free sample of our material VELVET STONE™ by VALLONE®. You can order it free of charge directly to your home. VELVET STONE™ verdankt seine hervorragenden Eigenschaften in Punkto Ästhetik und Beständigkeit einer individuellen Produktformel aus natürlichen Mineralien und hochwertigen Harzen. Der Herstellungsprozess basiert auf einem Gussvorgang, der eine nahezu unendliche Formgebung ermöglicht und dafür Sorge trägt, dass VALLONE-Produkte sprichwörtlich „aus einem Guss“ gefertigt werden. Neben ästhetischen Vorteilen bringt dies auch hygienischen Mehrwert: Die geschlossene, fugenfreie Fläche bietet keinerlei Angriffspunkte für Schmutz und schädliche Keime. Each of our products is handmade and has a natural white finish. For special requests we are offering a range of special colouring, for example a premium black finish outside (standard for model "VESUV"). VELVET STONE™ by VALLONE is the ideal material solution for great visual effect combined with practicality. 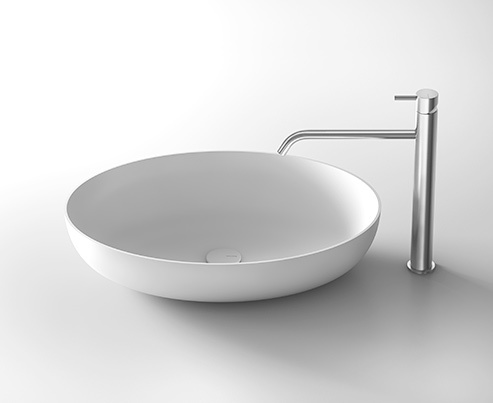 The surface easily endures daily use and guarantees long-lasting quality.